Polyamines are metabolites that play important roles in rapidly proliferating cells, and recent studies have highlighted their critical nature in Leishmania parasites. However, little is known about the function of polyamines in parasites. To address this question, we assessed the effect of polyamine depletion in Leishmania donovani mutants lacking ornithine decarboxylase (Δodc) or spermidine synthase (Δspdsyn). Intracellular putrescine levels depleted rapidly in Δodc mutants and accumulated in Δspdsyn mutants, while spermidine levels were maintained at low but stable levels in both cell lines. Putrescine depletion in the Δodc mutants led to cell rounding, immediate cessation of proliferation, and loss of viability, while putrescine-rich Δspdsyn mutants displayed an intermediate proliferation phenotype and were able to arrest in a quiescent-like state for 6 weeks. Supplementation of Δodc mutants with spermidine had little effect on cell proliferation and morphology but enabled parasites to persist for 14 weeks. Thus, putrescine is not only essential as precursor for spermidine formation but also critical for parasite proliferation, morphology, and viability. The online version of this article ( https://doi.org/10.1007/s00726-019-02736-z) contains supplementary material, which is available to authorized users. Parasites of the genus Leishmania cause a variety of devastating diseases in humans and domestic animals worldwide. The spectrum of leishmaniasis ranges from cutaneous ulcerative lesions to fatal visceralizing infections, and affects annually an estimated 12 million people worldwide (Kedzierski 2011). Among diseases of parasitic origin, visceral leishmaniasis is the second leading cause of mortality in humans (Alvar et al. 2012; Bern et al. 2008; Kaye and Scott 2011). The parasite exhibits a digenetic life cycle in which the extracellular promastigotes reside in the gut of the sand fly vector, whereas the intracellular amastigotes inhabit the phagolysosomes of macrophages in the infected mammalian host. Due to the absence of effective vaccines, chemotherapy offers the only avenue of defense against leishmaniasis (Kaye and Scott 2011; Kedzierski et al. 2009; Muller 2007). However, the currently available small arsenal of drugs used to treat leishmaniasis is far from ideal due to a lack of selectivity and emergence of drug resistance (Croft et al. 2006; Mishra et al. 2007; Ponte-Sucre et al. 2017; Singh et al. 2012). Thus, the need for a better understanding of parasite biology to develop new therapeutic strategies is urgent. One pathway that has already been validated as a therapeutic target in the related pathogen, Trypanosoma brucei gambiense, is that for polyamine biosynthesis (Babokhov et al. 2013; Bacchi and McCann 1987; Burri and Brun 2003; Docampo and Moreno 2003; Fairlamb 2003). d,l-α-Difluoromethylornithine (DFMO) is a suicide inhibitor of ornithine decarboxylase (ODC), the enzyme that catalyzes putrescine biosynthesis, and shows remarkable therapeutic efficacy in treating African sleeping sickness caused by T. brucei gambiense (Babokhov et al. 2013; Bacchi and McCann 1987; Burri and Brun 2003; Docampo and Moreno 2003; Fairlamb 2003). DFMO is also active against other protozoan parasites in vitro, including Plasmodia and Giardia (Bitonti et al. 1987; Gillin et al. 1984) and is effective against Leishmania in vitro and in murine and hamster infectivity models (Boitz et al. 2009; Gradoni et al. 1989; Kaur et al. 1986; Mukhopadhyay and Madhubala 1993; Olenyik et al. 2011). The polyamines putrescine, spermidine, and spermine are ubiquitous and essential cations that play critical roles in proliferation and survival, although their exact functions are still unclear (Igarashi and Kashiwagi 2010; Lenis et al. 2017; Miller-Fleming et al. 2015; Minois et al. 2011; Pegg 2016). Whether the three polyamines have different or overlapping functions and whether all three polyamines are essential remains unknown (Bachrach et al. 2001; Igarashi and Kashiwagi 2010). These analyses are particularly difficult due to the inter-conversion pathways that exist in mammalian cells (Seiler 2004; Seiler et al. 1981; Wang and Casero 2006). As putrescine levels are typically low in mammalian cells, this polyamine is often considered to be merely a precursor for spermidine and spermine formation (Battaglia et al. 2014; Casero and Marton 2007; Kahana 2018; Murray-Stewart et al. 2016; Tavladoraki et al. 2012). It is intriguing that while spermidine and spermine predominate in metazoans, putrescine and spermidine are more abundant in rapidly proliferating prokaryotes and unicellular eukaryotes (Igarashi and Kashiwagi 2010). In contrast to the plethora of studies on the functions of polyamines in mammalian cells, little is known about the functions of polyamines in protozoan parasites, although recent studies have highlighted the importance of the polyamine biosynthetic pathway as a potential therapeutic target (Birkholtz et al. 2011; Bisceglia et al. 2018; Heby et al. 2003, 2007; Ilari et al. 2015, 2017; Phillips 2018; Roberts and Ullman 2017). The polyamine biosynthetic pathway in Leishmania consists of four enzymes: arginase (ARG), ODC, spermidine synthase (SPDSYN), and S-adenosylmethionine decarboxylase (ADOMETDC) (Fig. 1). ARG, the first and committed step in polyamine biosynthesis, converts arginine to ornithine, which is subsequently metabolized to the diamine putrescine by the catalytic action of ODC. SPDSYN then generates spermidine via the addition of an aminopropyl group donated from decarboxylated S-adenosylmethionine. Spermine, a prevalent polyamine of higher eukaryotes, is neither synthesized nor utilized by Leishmania (Jiang et al. 1999) and no spermine synthase homolog can be found in Leishmania genomes (El-Sayed et al. 2005). Unique to trypanosomatids, which include T. brucei, T. cruzi, and Leishmania spp., is the conjugation of spermidine and glutathione to form trypanothione. This metabolite is essential to combat oxidative stress in parasites (Colotti and Ilari 2011; Ilari et al. 2017; Krauth-Siegel et al. 2003, 2007; Krauth-Siegel and Comini 2008; Krauth-Siegel and Inhoff 2003; Manta et al. 2013, 2018). In Leishmania, the enzyme trypanothione synthetase–amidase (TRYS) catalyzes the reversible formation of trypanothione (Fyfe et al. 2008). Spermidine is also used for the hypusination and activation of eukaryotic initiation factor 5A (eIF5A). The enzymes deoxyhypusine synthase (DHS) and deoxyhypusine hydroxylase (DOOH) are responsible for this reaction that has been found to be essential in Leishmania (Chawla et al. 2010, 2012) and the mammalian host (Park and Wolff 2018). ARG, ODC, SPDSYN, and ADOMETDC have all been validated as indispensable for the promastigote form of Leishmania donovani, as gene knockouts of each enzyme confer polyamine auxotrophy to the mutants, which can only be grown in the presence of appropriate polyamine supplementation (Jiang et al. 1999; Roberts 2013; Roberts et al. 2001, 2002, 2004). Studies with Δarg knockout mutants in several Leishmania species established that the sole essential role of ornithine is as a precursor for polyamine formation (Boitz et al. 2016; da Silva and Floeter-Winter 2014; da Silva et al. 2012; Reguera et al. 2009; Roberts et al. 2004). In contrast, the role of putrescine is more controversial. Although spermidine is the final polyamine of the pathway in Leishmania, and some studies suggest that spermidine is indeed the only essential polyamine (Jiang et al. 1999; Reguera et al. 2009), a more recent study shows that putrescine is essential beyond its role as a precursor for spermidine formation (Boitz et al. 2016). Murine infectivity studies have established an important role for parasite ARG in several cutaneous Leishmania species, L. mexicana, L. major, and L. amazonensis (da Silva et al. 2012; Gaur et al. 2007; Muleme et al. 2009; Reguera et al. 2009), and the visceralizing species L. donovani (Boitz et al. 2016). The Δarg knockout mutants in these strains exhibit lower infectivity levels than the corresponding wild-type parasites, although they are still able to establish infections (Boitz et al. 2016; da Silva et al. 2012; Gaur et al. 2007; Muleme et al. 2009; Reguera et al. 2009). In contrast, Δodc and Δspdsyn gene deletion mutants in L. donovani elicit profound reductions in parasite loads in infected mouse organs, with the Δodc deletion having the most striking effect (Boitz et al. 2009; Gilroy et al. 2011). These studies established the importance of polyamine biosynthesis in intracellular Leishmania parasites. In this study, we have examined the consequences of polyamine depletion in L. donovani Δodc and Δspdsyn gene deletion mutants to better understand the functions of polyamines in Leishmania. Putrescine was not only essential as a precursor for spermidine formation but also critical for parasite proliferation, morphology, and viability. Furthermore, while the absence of both polyamines caused imminent cell death, the presence of either putrescine or spermidine alone, allowed parasites to arrest in a quiescent-like state for several weeks. Dulbecco’s Modified Eagle’s Medium, chicken serum, and phleomycin were procured from Thermo Fisher Scientific (Waltham, MA, USA). Resazurin, putrescine, and spermidine were purchased from VWR International (Radnor, PA, USA). Dansyl chloride was obtained from Sigma-Aldrich (Burlington, MA, USA), and the Muse Count and Viability reagent was purchased from Millipore (Burlington, MA, USA). All genetically manipulated parasites were derived from the wild-type LdBob strain of L. donovani (Goyard et al. 2003) that was originally obtained from Dr. Stephen M. Beverley (Washington University, St. Louis, MO, USA). The Δodc and Δspdsyn mutants were previously generated by targeted gene replacement techniques (Boitz et al. 2009; Gilroy et al. 2011). Promastigote parasites were incubated at 27 °C in a completely defined Dulbecco’s Modified Eagle-based culture medium especially designed for the cultivation of Leishmania promastigotes, where fetal bovine serum was replaced with chicken serum to avoid polyamine oxidase-mediated toxicity (DME-L CS) (Iovannisci and Ullman 1983; Kaur et al. 1986; Roberts et al. 2001). The Δspdsyn cell line was maintained in 100 μM spermidine and the Δodc cell line was routinely grown in the presence of 100 μM putrescine, unless otherwise specified. Prior to performing the experiments described in this paper, the phenotype of the Δodc and Δspdsyn gene deletion mutants was verified by western blot analysis. Blots were probed with polyclonal rabbit antibodies raised against ODC and SPDSYN (Jiang et al. 1999; Roberts et al. 2001) and tubulin as a loading control, and the absence of ODC in the Δodc cell lines and SPDSYN in the Δspdsyn parasites was confirmed (Supplemental Fig. 1). Wild-type, Δodc, and Δspdsyn parasites were allowed to reach stationary phase in media supplemented with no polyamines (wild-type), with 100 μM putrescine (Δodc), or with 100 μM spermidine (Δspdsyn). Parasites were then harvested and washed three times in phosphate buffered saline (PBS), counted on a hemocytometer and seeded at defined cell numbers for all growth assays. To determine 50% effective concentration (EC50) values and concentrations of putrescine and spermidine required for optimal growth, Δodc and Δspdsyn parasites were seeded in a volume of 100 μl in 96-well plates at a density of 5 × 104/100 μl in serial dilutions of 1000 μM putrescine or 1000 μM spermidine. After 5 days, 15 μl of 250 μM resazurin was added to each well, and plates were incubated for an additional 4 h. To assess cellular proliferation, conversion of resazurin to resorufin was evaluated on a BioTek Synergy plate reader by monitoring fluorescence (579Ex/584Em). Graphs were prepared using GraphPad Prism version 6.0f for Mac. Data shown in Fig. 2 are from biological duplicates (n = 2). The experiment was repeated two more times with essentially the same outcome. To determine daily parasite growth rates, wild-type, Δodc, and Δspdsyn parasites were seeded in a volume of 10 ml at a density of 5 × 105/ml and counted in a hemocytometer daily for 7 days. The Δodc and Δspdsyn parasites were incubated in media containing no polyamines, 100 μM putrescine, 100 μM, 500 μM, or 1000 μM spermidine as indicated. Graphs were prepared using Microsoft Excel. Data displayed in Fig. 3 are from biological duplicates (n = 2). The experiment was repeated two more times with essentially the same outcome. Wild-type, Δodc, and Δspdsyn parasites were allowed to reach stationary phase in media supplemented with no polyamines (wild-type), with 100 μM putrescine (Δodc), or with 100 μM spermidine (Δspdsyn). Parasites were then harvested and washed three times in PBS. Wild-type parasites were then incubated in media without polyamines, Δodc parasites in the absence of polyamines, or in the presence of 100 µM putrescine, or 100 µM, 500 µM, or 1000 µM spermidine, and Δspdsyn parasites in the absence of polyamines or in the presence of 100 µM spermidine. Parasites (1 × 107) were harvested after 3 days, washed three times in PBS, and extracted for polyamine pool determination with 10% trichloroacetic acid (TCA) as described previously (Jiang et al. 1999; Shim and Fairlamb 1988). An internal standard, 1,7-diaminoheptane, was added to the polyamine–TCA solutions for further processing. Samples were extracted in ethyl acetate and dried on a Speed Vac concentrator. The samples were derivatized with a solution of dansyl chloride (fluorescent label) and proline was added to scavenge the excess dansyl chloride. The derivatized polyamines were recovered with two ethyl acetate extractions, the organic layers were pooled and dried, and samples were dissolved in 200 μl of 95% methanol/5% acetic acid. The polyamines were separated by high-performance liquid chromatography (flow rate = 1 ml/min) on a Shimadzu Prominence system equipped with a Phenomenex Kinetix C18 XB reversed-phase column (100 × 4.6 mm; 5 µm; 100 Å). Gradient elution (45% B–80% B from 0 to 14 min; 80% B from 14 to 15 min) with solvent A (10 mM sodium phosphate; pH = 7.2) and solvent B (acetonitrile) was used to separate putrescine (retention time ≈ 8.6 min), spermidine (retention time ≈ 13.9 min), and the internal standard 1,7-diaminoheptane (retention time ≈ 11.1 min). Fluorescence was measured on a Shimadzu RF-535 detector (340Ex/515EM). LabSolutions version 5.73 by Shimadzu Corporation (Kyoto, Japan) software was used to calculate peak areas. A comparison of peak areas from samples to standard curves of putrescine and spermidine, which contained the internal standard 1,7-diaminoheptane, was used to quantify the individual polyamines. The experiments were conducted three times with biological triplicates for each experiment and the data (total n = 9 per cell line and condition) are shown in Fig. 4. The unpaired t test was used to evaluate statistical significance. Wild-type, Δodc, and Δspdsyn parasites were allowed to reach stationary phase in media supplemented with no polyamines (wild-type), with 100 μM putrescine (Δodc), or with 100 μM spermidine (Δspdsyn). Parasites were then harvested, washed three times in PBS, and seeded in media with or without supplementation with polyamines. After 3 days, 500 μl parasites were harvested, washed once in PBS, and 20 μl samples were placed on poly-l-lysine-coated slides. Coverslips were applied without sealing. Bright-field images were taken on an AMG Evos XL at 40 × magnification within 10 min of adding samples to the slides. The experiment was repeated more than three times and visual observations were consistent. Cell body lengths, excluding the flagellum, were measured using an Olympus BX41 microscope at 40 × magnification utilizing the Neurolucida software (MBF Biosciences). Three independent experiments were performed and 50–100 cells for each parasite strain and condition were measured in each experiment, with a total of 200–250 cells measured for each parasite strain and condition. The unpaired T test was performed using GraphPad software for statistical analysis. Wild-type, Δodc, and Δspdsyn parasites were allowed to reach stationary phase in media supplemented with no polyamines (wild-type), with 100 μM putrescine (Δodc), or with 100 μM spermidine (Δspdsyn). Parasites were then harvested, washed three times in PBS, and seeded in media with or without supplementation with polyamines. All cell lines were seeded at 3 × 105/ml and samples were taken daily. Viability was assessed on a Muse® Cell Analyzer (Millipore Sigma) using the Muse™ Count and Viability reagent according to the manufacturer’s manual. Briefly, Count and Viability reagent was added to each microcentrifuge containing parasite samples and incubated for 5 min at room temperature before inserting into the Muse® Cell Analyzer. Graphs were prepared using GraphPad. Data from three biological replicates (n = 3) are displayed in Fig. 6. The experiment was repeated two more times with essentially the same outcome. Parasite survival was determined with a long-term rescue assay. Wild-type, Δodc, and Δspdsyn parasites were allowed to reach stationary phase in media supplemented with no polyamines (wild-type), with 100 μM putrescine (Δodc), or with 100 μM spermidine (Δspdsyn). Parasites were then harvested and washed three times in PBS. The Δodc mutants were seeded at 5 × 106 cells/ml in 10 ml media without polyamine supplementation or in media containing 100 μM spermidine. The Δspdsyn mutants were seeded at 1 × 106 cells/ml in 10 ml media without polyamine supplementation. Multiple flasks were set up for each cell line and condition. Over the course of 18 weeks, weekly 500 μl aliquots were taken from two flasks per cell line and condition, spun down, and pellets were resuspended in 1 ml media containing either 100 μM putrescine (Δodc) or 100 μM spermidine (Δspdsyn). The 1 ml parasite cultures were transferred into 24-well plates. One or two weeks after the rescue attempt, parasite survival was assessed under the microscope. Samples that showed healthy and motile parasites were deemed alive (rescued), while samples that showed non-motile forms were deemed dead. The experiment was repeated six times for Δodc and Δspdsyn mutants incubated in media without polyamine supplementation and three times for Δodc parasites incubated in media with 100 μM spermidine. Each time, the rescue attempts were performed in duplicates. To establish EC50 values for putrescine and spermidine, and determine concentrations necessary for optimal growth of Δodc and Δspdsyn parasites, mutants were incubated in serial dilutions of 1000 μM putrescine or 1000 μM spermidine. Cell growth was assessed by measuring the conversion of resazurin to resorufin after 5 days (Fig. 2). The Δodc parasites required the addition of 5.80 ± 1.56 μM putrescine to the media for optimal growth, with an EC50 of 1.88 ± 0.54 μM (average of three experiments performed in duplicates). The downstream metabolite spermidine was not able to restore growth of Δodc parasites at concentrations up to 1000 μM. The Δspdsyn parasites depended on 55.00 ± 7.07 μM spermidine supplementation for ideal growth, with an EC50 of 11.5 ± 9.19 μM (average of three experiments performed in duplicate). Supplementation of Δspdsyn parasites with putrescine, the substrate for the spermidine synthase reaction, did not rescue the growth defect of the Δspdsyn mutants. As Δspdsyn parasites are able to synthesize putrescine, the addition of putrescine was not expected to have an effect on growth. Proliferation of Δodc and Δspdsyn parasites incubated in polyamine-free or supplemented media was compared by counting cell numbers over the course of 7 days (Fig. 3). 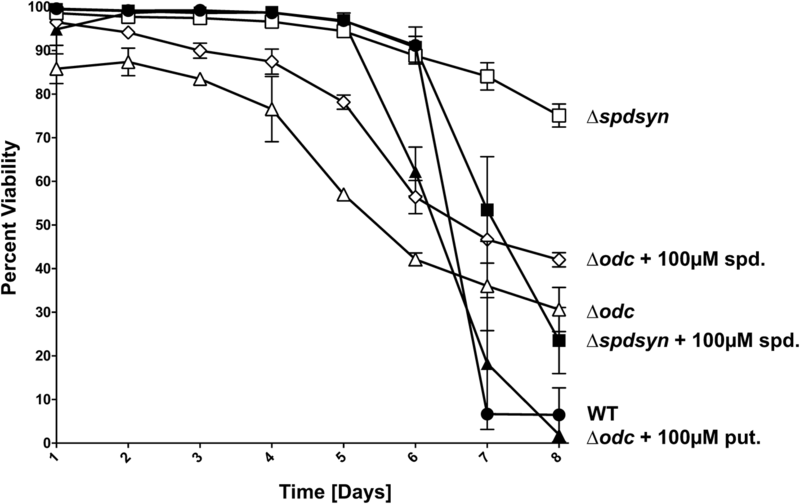 Wild-type parasites, Δodc mutants supplemented with 100 μM putrescine, and Δspdsyn mutants supplemented with 100 μM spermidine proliferated optimally over the course of the experiment (Fig. 3a). It should be noted that the supplemented Δspdsyn mutants showed slightly higher growth rates than the wild-type or supplemented Δodc mutants in Fig. 3a. However, growth curves of wild-type parasites and supplemented mutants were repeated numerous times and within the range of normal fluctuations these three cell lines proliferated equally well, which has also been reported previously (Boitz et al. 2009; Gilroy et al. 2011). In contrast, the Δodc mutants grown in polyamine-free media arrested cell division immediately (Fig. 3b). To investigate if this severe growth defect was due to the depletion of putrescine alone or both putrescine and spermidine, the Δodc mutants were incubated in the presence of 100 μM, 500 μM, or 1000 μM spermidine. Some improvement in cell growth was observed in Δodc parasites in media supplemented with 500 μM or 1000 μM spermidine; however, it did not reach the level of growth observed in Δspdsyn mutants (Fig. 3b). In comparison with the Δodc mutants, the Δspdsyn parasites incubated in polyamine-free media exhibited an intermediate growth phenotype (Fig. 3b). The Δspdsyn parasites were initially seeded at 5 × 105 parasites/ml and reached a density of about 1 × 107 parasites/ml after 7 days, indicating that cells divided four to five times. To correlate the observed growth deficits with intracellular putrescine and spermidine levels, polyamine pools were measured in wild-type and mutant parasites. Wild-type cells were incubated in media without supplementation, and the Δodc and Δspdsyn gene deletion mutants were incubated in media with or without polyamine supplementations for 3 days before parasites were harvested for the analysis of intracellular polyamine content. Intracellular putrescine levels were below the detection level in Δodc parasites incubated in polyamine-free media or in media containing various concentrations of spermidine (Fig. 4). When the Δodc mutants were incubated in media supplemented with 100 μM putrescine, the intracellular putrescine levels were about twofold higher than in wild-type parasites, suggesting that a robust uptake of putrescine occurred in these cells to counter the inability to synthesize putrescine. Putrescine levels were about three- and fivefold higher in Δspdsyn mutants incubated in media with or without spermidine, respectively, than in wild-type parasites. This observation can likely be ascribed to an accumulation of putrescine due to the inability of Δspdsyn mutants to convert putrescine to spermidine. 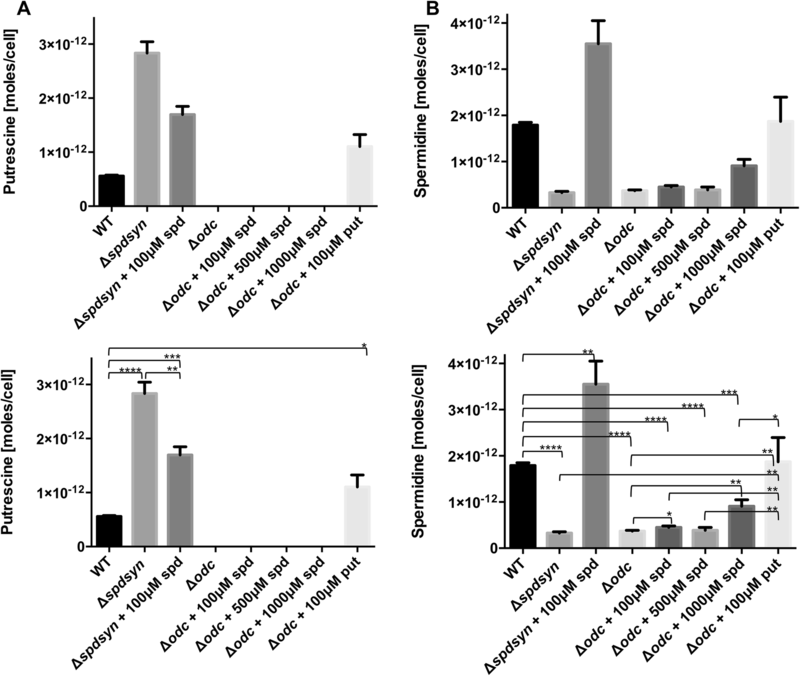 Intracellular spermidine levels in the Δodc and Δspdsyn parasites incubated in spermidine-free media were considerably lower than in wild-type parasites. However, in contrast to the profound depletion of putrescine levels in Δodc mutants (below detection level), spermidine levels in both Δodc and Δspdsyn parasites were only about fivefold lower than in wild-type parasites. Supplementation of Δspdsyn mutants with 100 μM spermidine resulted in a twofold increase of spermidine levels compared to wild-type parasites, suggesting robust uptake to counter the inability to synthesize spermidine. In contrast, supplementation of Δodc parasites with 100, 500, or 1000 μM spermidine did not restore spermidine levels to that of wild-type parasites. In fact, only supplementation of Δodc parasites with 1000 μM spermidine caused a modest increase of spermidine levels compared to those of Δodc parasites incubated in polyamine-free media. Taken together, the analysis of intracellular polyamine levels revealed that both mutant cell lines, Δodc and Δspdsyn, contained low levels of intracellular spermidine but only the Δspdsyn mutants contained putrescine. Thus, the immediate cessation of cellular proliferation and other phenotypic observations in the starved Δodc cell line (described below) correlated with the loss of putrescine. The effect of polyamine deficiencies on parasite morphology was assessed. The Δodc mutants incubated in polyamine-free or spermidine-supplemented media exhibited a more rounded morphology (Fig. 5), were less motile (data not shown) and more prone to form clusters compared to wild-type or putrescine-supplemented Δodc parasites. 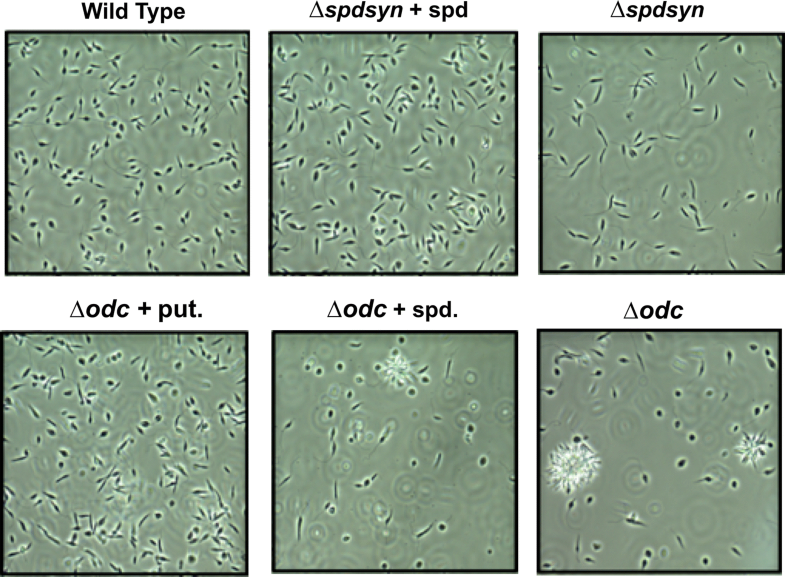 In contrast, Δspdsyn parasites incubated in media without spermidine showed cell shapes and motility similar to wild-type or supplemented Δspdsyn mutants (Fig. 5). Cell body lengths (without flagella) were measured and compared for the different cell lines and supplement conditions after 3 days of starvation. The body length of putrescine-depleted Δodc parasites averaged 6.27 ± 1.17 μm, while putrescine-supplemented Δodc and wild-type parasites exhibited lengths of 11.88 ± 1.43 μm and 14.41 ± 0.17 μm, respectively (Table 1). In contrast, the body length of spermidine-depleted Δspdsyn parasites, 12.51 ± 1.18 μm, was similar to that of spermidine-supplemented Δspdsyn, 12.22 ± 0.63 μm, and wild-type parasites, 14.41 ± 0.17 μm. Statistical analysis (unpaired student t test) confirmed that the differences between the body lengths of the putrescine-depleted Δodc parasites and the putrescine-supplemented Δodc parasites or wild-type parasites were statistically significant. The putrescine-starved Δodc parasites ceased proliferation immediately (Fig. 3), demonstrated a rounded morphology (Fig. 5 and Table 1), and most parasites appeared to be non-motile (data not shown). However, as these observations did not discern whether parasites were alive or dead, the percentage of viable parasites was determined by flow cytometry. Wild-type parasites, Δspdsyn parasites supplemented with spermidine, and Δodc parasites supplemented with putrescine showed a high percentage of viable parasites, ~ 90%, up to day 4 or 5 (Fig. 6). Once the culture reached stationary phase and a high density, viability plummeted rapidly (Fig. 6). The Δspdsyn mutants grown in the absence of polyamines sustained a high viability of above 70% even after 8 days of starvation, while the Δodc parasites with or without supplementation of spermidine showed a gradual decline in viability, starting by day 2 or 3, and reached a low 45% (Δodc with spermidine) and 30% (Δodc) viability by day 8 (Fig. 6). The addition of 100 µM spermidine improved viability of the Δodc parasites slightly. This analysis demonstrates that the putrescine-depleted Δodc parasites not only ceased proliferation, they also showed a steady decrease of cell viability under polyamine starvation conditions. Parasite survival was determined over the course of several weeks by a rescue assay. For this assay, parasites were incubated in starvation conditions and samples were taken once a week. Rescue was attempted by the addition of putrescine or spermidine to the Δodc and Δspdsyn parasite cultures, respectively. The Δodc parasites incubated in polyamine-free media survived for only approximately 2 weeks; and could not be rescued by the addition of 100 μM putrescine after that time (Table 2). In contrast, the addition of 100 μM spermidine allowed Δodc mutants to persist for 14 weeks (Table 2). The Δspdsyn parasites incubated in polyamine-free media showed an intermediate survival phenotype and lived for 6 weeks in a quiescent-like state (Table 2). Our studies demonstrate that both polyamines, putrescine and spermidine, are essential for Leishmania and that putrescine has previously unrecognized vital functions beyond its role as a precursor for spermidine formation. Putrescine-depleted Δodc parasites showed a more profound decrease in proliferation and viability compared to putrescine-rich Δspdsyn parasites, pointing towards specific functions of putrescine for these cellular processes. Spermidine is the final product of the polyamine biosynthetic pathway in Leishmania (Fig. 1) and has been proposed to be the only essential polyamine (Heby et al. 2007; Jiang et al. 1999; Reguera et al. 2009). 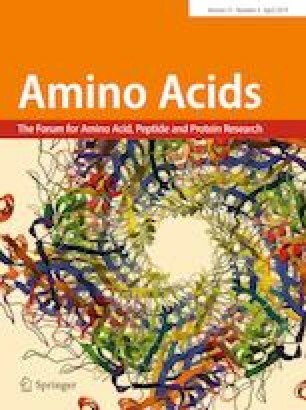 Indeed, studies have demonstrated that the sole essential function of the amino acid ornithine is as precursor for the polyamine biosynthesis in Leishmania (Boitz et al. 2016; da Silva and Floeter-Winter 2014; da Silva et al. 2012; Reguera et al. 2009; Roberts et al. 2004). Similarly, it has been suggested that putrescine is merely the precursor metabolite for spermidine formation, and supplementation of spermidine was found to be sufficient to at least partially restore growth in L. major Δarg and L. donovani Δodc mutants (Jiang et al. 1999; Reguera et al. 2009). However, a recent study found that L. donovani Δarg mutants did not proliferate in the presence of spermidine (Boitz et al. 2016) and we now report that supplementation of up to 1000 μM spermidine did not rescue L. donovani Δodc mutants. 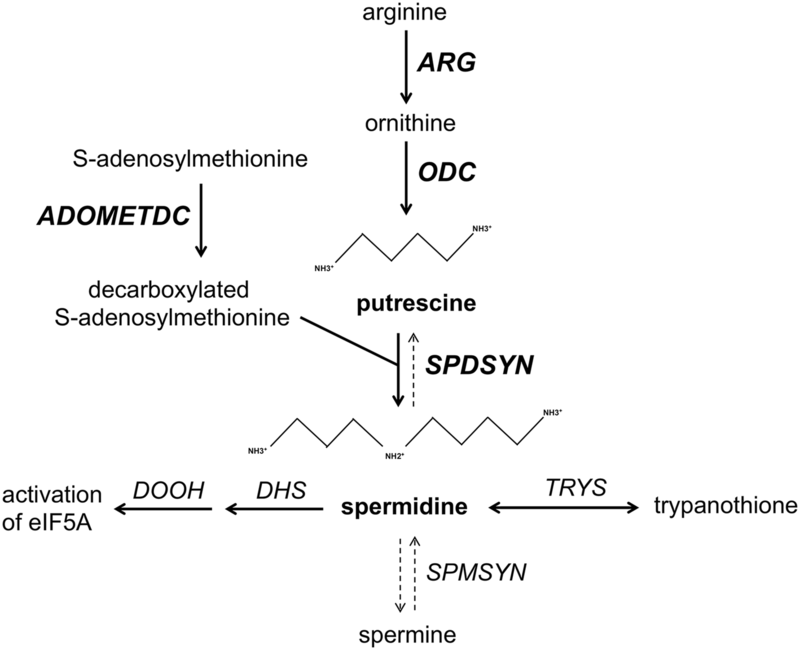 Previous observations that spermidine was able to partially restore growth of L. major Δarg or L. donovani Δodc mutants may have been caused by putrescine contaminations of commercially available spermidine. This conjecture is plausible as the EC50 values for putrescine were 7.5 μM for L. donovani Δarg (Boitz et al. 2016) and 1.88 μM for L. donovani Δodc mutants (Fig. 2a), and thus very small amounts of putrescine contamination could be sufficient to allow at least some growth. Our observation that L. donovani Δodc mutants showed a slight increase in growth at 500 and 1000 μM (Fig. 2a) can possibly also be ascribed to small amounts of putrescine in the spermidine stock solution. The more recent observations that L. donovani Δarg (Boitz et al. 2016) and Δodc mutants (Fig. 2) require putrescine supplementation is profound as it shifts the current paradigm of the importance of putrescine from being a precursor metabolite to having essential functions on its own. Intriguingly, similar observations have been made in T. brucei, where RNAi-mediated silencing of ODC could be rescued by supplementation with putrescine but not spermidine and silencing of ODC resulted in a more rapid cell death than silencing of SPDSYN (Xiao et al. 2009). Although this observation was ascribed to the lack of both putrescine and spermidine, it is feasible that putrescine has a uniquely important function for trypanosomatids. The experiments presented here reveal that putrescine is essential for parasite proliferation as putrescine-depleted Δodc mutants displayed an immediate cessation of proliferation, while putrescine-rich Δspdsyn mutants exhibited an intermediate proliferation phenotype compared to the Δodc mutants (Fig. 3). As both cell lines contained similar, albeit low, amounts of spermidine (Fig. 4), the immediate cessation of proliferation in the Δodc mutants can be attributed to the lack of putrescine. In mammalian cells, polyamines have been linked to cellular proliferation (Bachrach et al. 2001; Igarashi and Kashiwagi 2000, 2010; Miller-Fleming et al. 2015; Minois et al. 2011; Pegg 2016); however, the contributions of putrescine, spermidine, or spermine are difficult to discern as mammalian cells have catabolic pathways that can convert spermine and spermidine to putrescine (Bachrach et al. 2001; Igarashi and Kashiwagi 2010; Seiler 2004; Seiler et al. 1981). Because Leishmania parasites lack a back-conversion pathway to recover lost pools of putrescine, our results show for the first time an unambiguous function of putrescine for cellular proliferation. As stated above, mutant parasites incubated in polyamine-free media contained spermidine (Fig. 4). Previous measurements of intracellular pools in L. donovani Δodc and Δspdsyn knockout cell lines also showed that parasites maintained low but stable levels of spermidine over several days of starvation (Jiang et al. 1999; Roberts et al. 2001). Similarly, studies in L. major Δarg mutants and arginine-depleted L. donovani wild-type parasites found a marked decrease of putrescine levels while spermidine pools diminished at a slower rate (Mandal et al. 2016; Reguera et al. 2009). Spermidine is an essential metabolite for the hypusination and activation of eIF5A (Chawla et al. 2010, 2012) and the formation of trypanothione (Colotti and Ilari 2011; Ilari et al. 2017). It is conceivable that less spermidine is being used for these downstream reactions to maintain spermidine pools. It is also possible that spermidine is formed from trypanothione as TRYS is a bifunctional enzyme catalyzing the biosynthesis and hydrolysis of trypanothione (Fyfe et al. 2008). Although, we have previously shown that trypanothione levels in starved L. donovani Δodc and Δspdsyn parasites indeed plummet over time (Jiang et al. 1999; Roberts et al. 2001), it is unknown whether this is due to a lack of trypanothione formation or conversion of trypanothione to spermidine. Regardless, the observation that polyamine-starved parasites maintain low but stable levels of spermidine underscore the importance of this polyamine. Interestingly, a comparison of Δodc and Δspdsyn parasites incubated in spermidine-supplemented media showed a profound difference in spermidine levels (Fig. 4), although both cell strains would have been expected to compensate for the loss of spermidine biosynthesis by increased uptake. While the Δspdsyn mutants incubated in 100 μM spermidine exhibited a twofold increase in spermidine levels compared to spermidine levels in wild-type cells, Δodc parasites incubated with 100 μM, 500 μM, or 1000 μM spermidine displayed spermidine levels that were lower than in wild-type parasites (Fig. 4). Thus, Δspdsyn parasites markedly increased spermidine uptake while Δodc parasites did not, which leads to intriguing speculations about the molecular mechanisms regulating spermidine transport. Perhaps, increased transport of spermidine in Δspdsyn parasites is regulated by loss of SPDSYN activity or metabolite flux rather than levels of metabolite pools. This conjecture is supported by a previous study on arginine transport in L. donovani Δodc and Δspdsyn parasites, which showed a significant reduction in arginine transport, even in the presence of putrescine or spermidine (Darlyuk et al. 2009). An alternative explanation for our observation that Δodc parasites exhibited only little increase in uptake of spermidine may be that the Δodc parasites, after 3 days of starvation, were already compromised in health and were thus not capable of robust uptake of spermidine. Differences in morphology and motility between the two mutant strains were also substantial. While the starved Δodc parasites rounded up and clumped together within a few days, the starved Δspdsyn mutants exhibited morphology similar to that of wild-type parasites and supplemented mutants throughout several days of starvation (Fig. 5). The observation that putrescine depletion caused this severe stress phenotype further supports our hypothesis that putrescine fulfills important roles in parasites. Both Δodc and Δspdsyn mutants perished in media without the supplementation of putrescine or spermidine, respectively, although at different times. The Δodc parasites showed reduced viability within a few days (Fig. 6) and died after 2 weeks (Table 2). It is likely that the small amount of intracellular spermidine present after 3 days of starvation was depleted after 2 weeks, and that the lack of both polyamines caused cell death. In contrast, Δspdsyn parasites maintained a high level of viability (over 70%), during 8 days of starvation (Fig. 6), and were able to survive for an average of 6 weeks before cell death occurred (Table 2). The presence of putrescine alone appeared to be sufficient to allow Δspdsyn parasites to enter a quiescent-like state. Surprisingly, the addition of 100 μM spermidine to Δodc parasites enabled the mutants to survive for 14 weeks (Table 2). Thus, although the supplementation of Δodc parasites with spermidine had only a marginal effect on proliferation (Fig. 3) or initial viability (Fig. 6), it had a profound effect on parasite survival. Further experiments are necessary to quantitate differences in cell death in these cultures, and to determine what types of adaptations or mutations allowed persistence. Spermidine has been implied to have a role in longevity in mammalian cells, yeast, and nematodes (Madeo et al. 2010; Morselli et al. 2009; Petrovski and Das 2010), and polyamines may have a similar effect in Leishmania parasites. Thus, while both polyamines were essential for ultimate parasite survival, the presence of either putrescine or spermidine alone may allow parasites to survive for several weeks in a quiescent-like state. The intracellular mechanism and reprogramming associated with this phenomenon could be of clinical importance, as Leishmania parasites may also persist in infected patients (Bogdan 2008; Mandell and Beverley 2017). While some studies have investigated how the human immune system suppresses parasite numbers, very few investigations have explored how the parasite is able to persist. It is of interest to note that the proliferation and survival discrepancies between the Δodc and Δspdsyn mutants mirrored in vivo infectivity phenotypes. While Δodc parasites exhibit profoundly diminished infectivity in mice compared to wild-type parasites (Boitz et al. 2009), the Δspdsyn parasites show a less pronounced, although significant, reduction in intracellular survival (Gilroy et al. 2011). We previously postulated that putrescine salvage is severely limited in the phagolysosome (Boitz et al. 2016). Together, these observations suggest that putrescine is a key metabolite for both promastigotes and intracellular amastigotes, and validate the polyamine biosynthetic enzyme ODC as a promising therapeutic target. Collectively, our observations confirm a previous report that putrescine is not merely a precursor metabolite for spermidine formation and, furthermore, suggest that putrescine has specific functions for parasite proliferation and viability. While the polyamine biosynthetic pathway has already been endorsed as a potential therapeutic target, our studies highlight ODC inhibition and putrescine depletion as the most promising strategy. In addition, our results suggest that both polyamines are essential for parasite survival but that the presence of either putrescine or spermidine alone may have allowed parasites to survive in a quiescent-like state for several weeks. The Δodc and Δspdsyn mutants are valuable model systems to not only study the functions of putrescine but also to elucidate processes vital for proliferation and for intracellular reprogramming associated with survival versus cell death, which may ultimately lead to new therapeutic strategies. This work was supported in part by Grant AI041622 from the National Institute of Allergy and Infectious Diseases and Pacific University School of Pharmacy Research Incentive Grants. We thank Amber Buhler for microscopy and analysis training, Jon Taylor for technical support, and Amber Buhler and Jon Taylor for critically reading of the manuscript and providing feedback.